Tracy's Bits N Pieces: Comma Wedge Quilt Complete! I've got a finish this morning! The Comma Wedge Quilt is quilted and bound. This one was so much fun to make. I'm sure I will use these little wedges again. My friend Cyndi quilted this on her long arm in an orange peel design. I love how it echoes the orange peel in some of the fabric. I used a black fabric with small white dots for the binding. It is backed with an Ikea duvet cover that I chopped up. Perfection. Beautiful quilt and of course I love the backing!! It's wonderful! I saw candy corn/Halloween theme from a distance, but close up loved your modern fabrics! 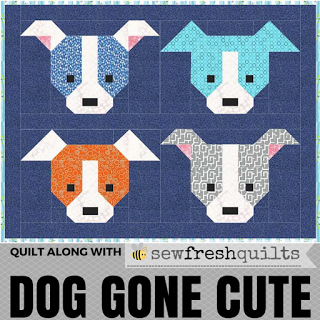 As they say, each quilt is really TWO quilts. Also, I think the little pin dot made a great binding for you, too. Good choices. Great job and I do love that backing fabric. Go Ikea!! This is great, love the graphic black and white lettering fabric ( as well as the Ikea duvet- Genius) with the colorful fabric. Cute! Makes me ready for fall!